Himeville – A large contingent of former Springbok legends are once again set to descend upon the Adventure event of this year’s KAP sani2c which takes place from 11-13 May with the group eager to soak up three days of banter, reminiscing and memorable mountain biking action. The smattering of Cell C South African Rugby Legends Association (SARLA) teams, represented by former Springbok household rugby names and rugby personalities such as Stefan Terblanche, Butch James, Brent Russell, Trevor Halsted, Neil Penrose and Shaun Payne – amongst others, are looking forward to tackling the mountain biking voyage from Glencairn, Underberg down to the KwaZulu-Natal’s South Coast town of Scottburgh. 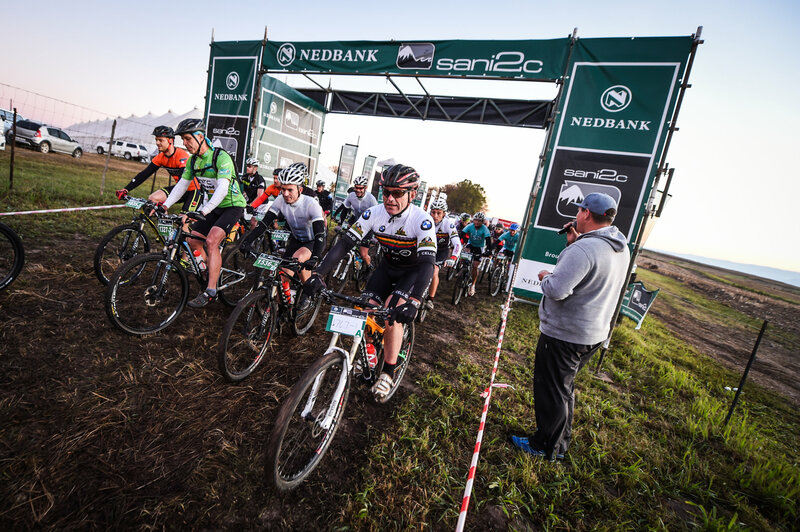 “sani2c is such an incredible, fun event and every time we take part we have such a jol that we cannot wait to go back each year!” says SARLA CEO, Stefan Terblanche. While the internal rivalry amongst the SARLA teams is hard to ignore, the former rugby icons still find the time to take in the route’s spectacular scenery while also relishing reuniting and working together with some of their former team mates along the way. “We ride the first two days in our respective pairs as best we all can and there is also often a lot of banter exchanged between the guys in the evenings, just like there used to be in the change room back in our playing days! “On day three we usually all ride down to Scottburgh together though, enjoying the last bit of the adventure as a group with some of the stronger guys helping pull the weaker guys, etc.” explains Terblanche. 2015 saw 1995 Rugby World Cup winning flyhalf Joel Stransky and Cell C Sharks flyer Shaun Payne race their way into podium contention during the first two days of the Adventure event that they were freed of their final stage duties and allowed to embrace their competitive nature once more. “Last year Joel (Stransky) and Shaun (Payne) were right up there in the top three after the first two days so they went for it again on day three and eventually finished second overall! “It just goes to show the competitiveness still in some of our guys! Despite having been in peak physical condition during their playing days, Terblanche admits the second stage’s notorious climb out of the uMkomaas valley still gets the butterflies going for most. “Day One is fantastic and the drop down into the Umko valley on Day Two is unbelievable! “That climb out again is a real tester though and definitely gets some of the guys pretty nervous the night before!” he laughs. The enjoyment of each other’s company and reuniting with former on-field colleagues is, however, another major highlight of the trip for the SARLA riders. “All our SARLA guys stay together at a guest house on a nearby farm where we all braai the one evening and they cook for us the other. “We enjoy some beers and a couple of bottles of red wine together around the fire in the evening and often guys will enjoy telling some of the many stories from our playing days and all the tours we enjoyed together. The Trail, Adventure and Race events of the 2016 KAP sani2c take place from Glencairn in Underberg to Scottburgh on KZN’s South Coast from 10-12, 11-13 and 12-14 May respectively. For more information visit www.sani2c.co.za.